This joke game brings so much fun to anyone who will play it. 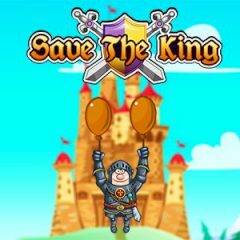 Just look at this cute knight with two balloons in his hands and deliver him higher quickly! Your king was kidnapped by an evil dragon, so you must bring him back. However, you are alone and the road is dangerous, but your king has no one else to rely on. Will you make it possible to release the ruler? Take two balloons and proceed to the high place where the dragon lives.